Wind power is an important pillar in Germany's energy policy turnaround: According to the German government, the resource should cover 65 percent of German electricity needs by 2030, along with solar, hydropower and biomass. In a recent study, Dr. Christopher Jung and Dr. Dirk Schindler from the University of Freiburg show that it will be possible to cover 40 percent of the current electricity consumption with wind energy alone by the year 2030. The prerequisite is that the operators distribute the plants optimally on the German mainland. 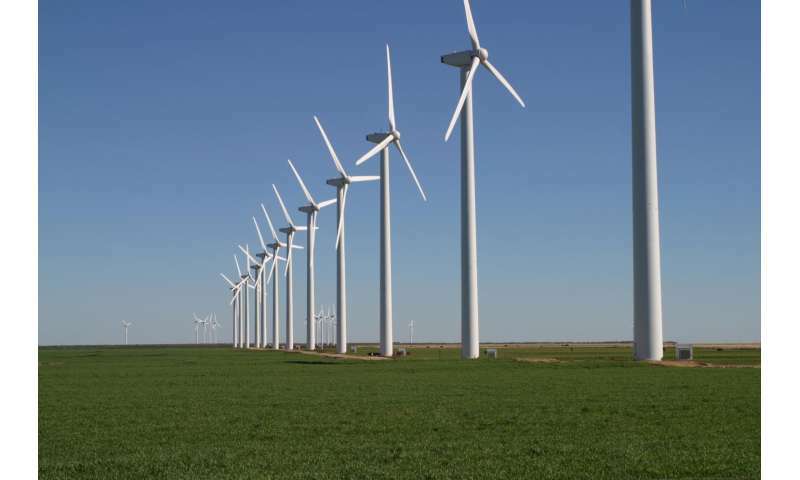 To estimate usable wind energy, the researchers have developed a new three-dimensional model. As a basis for their calculation, they used the number of new installations in 2017. If it remains constant until 2030, Germany can reach the calculated value. The team recently published its findings in the journal Energy Conversion and Management. A fundamental idea of the researchers while developing the model was to increase the efficiency with which the wind power is used. The scientists show that in particular repowering—i.e., the replacement of old, small plants with newer, larger ones—enables enormous increases in yields of up to several hundred percent. As a result, the cost of generating electricity, which is created when the energy is converted into electricity, can be reduced significantly to a level comparable to that of brown coal. However, in order to meet the current expansion targets of the Federal Government, a significant portion of the 30,000 wind turbines must be renewed and 6,000 additional systems must be additionally installed. Based on the researchers' model, the available wind resources can be determined for all common plant types. Also, the expansion target can be adjusted as desired. Using the model, scientists can develop and assess scenarios in which the plant density, the expansion strategy and the repowering intensity are varied. The model also allows for a balanced spatial distribution. "In principal, we can avoid a disproportionate concentration in certain regions," summarizes Jung. In addition, the algorithm takes into account that the number of new installations to be installed is kept as low as possible. "This would minimize disruptions in the landscape while taking the landscape and nature conservation into account," says Schindler.